Favourited amongst Pilots, the Breitling Navitimer 46 offers exceptional accuracy and reliability. With a stainless steel bracelet and case, the chronograph dial is framed with a distinctive ridged bezel. Powered by chronometer-certified automatic movement, this timepiece strikes the perfect balance between style and function. 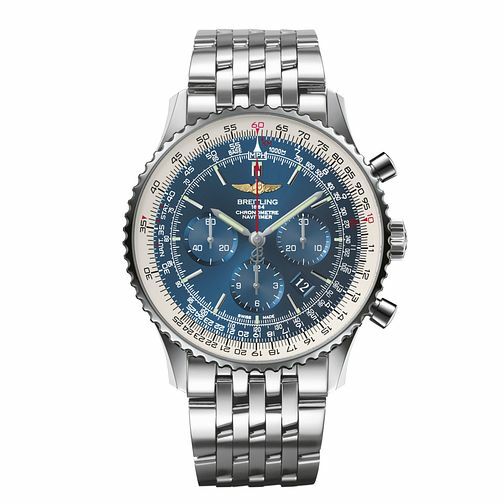 Breitling Navitimer 46 men's stainless steel bracelet watch is rated 5.0 out of 5 by 2. Rated 5 out of 5 by Anonymous from Stunning colour & quality Recently purchased and its stunning. The larger 46mm face really makes a difference. Great to be able to see the inside workings through the glass on the back. The leather box the watch comes in is also superb. Excellent service from Leslie Davis in MK. Highly recommended. Rated 5 out of 5 by Anonymous from Breitling manufactured in house movement, Bought recently from Ernest jones at Brent Cross appreciate the excellent service received from the store manager, beautiful watch and very rare for breitling to make watches with back caseing made of sapphire crystal were you will be able to admire the mechanical movements through the back casing, and compared to other navitimer this is all in house movement.